Dennis Frederiksen of Fraser Yachts in Monaco asks me to broadcast the fact that Feadship's 46m superyacht Northern Light is now 'very, very seriously' for sale as her owner would like a transaction completed before the end of this year and is inviting sensible offers. Built in 2001 and benefitting from a recent paint job and new generators, the superyacht's Lloyds classed and MCA compliant with a five stateroom layout for 10 guests. 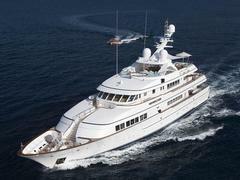 _Northern Light _is currently on the market at €24.9 million.